Angela Wallace is a Registered Dietitian and Project Coordinator for the Family Food Skills Study (FFSS), a sub-study of the Guelph Family Health Study (GFHS) at the University of Guelph. FFSS is analyzing the associations between parental food skills and food purchasing patterns, dietary intake, and household food waste. Angela also works as a health educator for the GFHS, to support families in creating healthy routines around physical activity, family meals, and sleep. She is passionate about discovering ways to support families in developing healthy eating habits. Angela enjoys sharing recipes and practical nutrition tips through her Eat Right Feel Right blog and other media outlets. 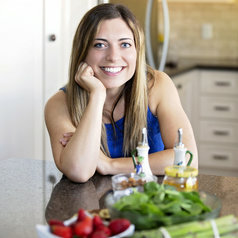 By doing so, she hopes to inspire, educate, and empower families to make healthy lifestyle changes that work for them!